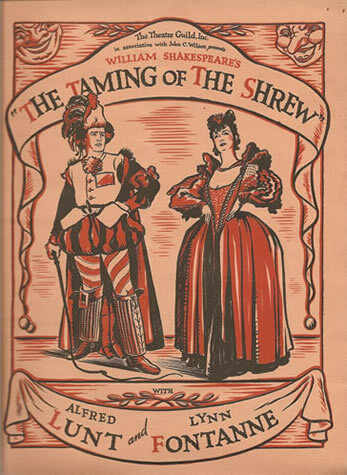 The post is inspired by the all-female production of The Taming of the Shrew, directed by Phyllida Lloyd, which was just recently at the Delacorte. I was not planning on doing a post about this show, given that it’s not a play that I particularly love. But ignoring it seemed foolish. Shakespeare only wrote so many plays and this play is far more likely to be produced many of his histories. And if someone offered me the chance to direct it, I would be thrilled…and then I would be like “oh crap, how do I make this a story that I can stomach watching.” So in the interest of thinking along those lines, here we go. I’ve said it before and I’ll probably say every time I see it. I love seeing all these ladies playing roles they never get to play. I absolutely love it. In this production, the ladies who were playing male roles were costumed as men. In Ms. Lloyd’s all-female production of Henry V which I wrote about previously, the women were not actually costumed to look like men. Instead a masculine quality was suggested through their physicality. I prefer just making use of the physicality because it allows them the best of both worlds – being able to remain women, but take on characteristics that are traditionally viewed as male such as authority, aggression, bravado, etc. But, on the other hand, having them costumed as men, as they were in this production, did eliminate the friction around the question of what does gender mean when a play written for two distinct genders that’s now being performed by only one. The Times did a feature article inspired by this production, asking whether or not we should continue to bother with producing this play. For it they interviewed Ms. Lloyd, Julie Taymor and Tina Packer (from Shakespeare & Company). Thoughts on the play seem to range from “it’s important to tell because of the present day misogyny that continues to exist” to “this is a love story between an atypical woman and her equal.” I agree with both of those view points to a degree. This production, by using the framing devise of a beauty pageant, suggests that life for women is one unending Miss America contest, which is valid but not exactly a story that I’m excited to tell. I do think this is a story about keeping up appearances. Every character except Kate is trying to convince us (and the people around them) that they are the picture of propriety. I’m interested in Kate learning (more appropriately, being forced to learn) how to play the game…so that she can undermine it. I’m more interested in saying “you have to be playing the game in order to change the game.” Which I think could be difficult to chisel out of this piece, but might be possible. Whenever I’ve heard people talk about casting an actress for Kate, they talk about casting an actress who is strong and feisty. Which is the right answer. First and foremost we have to believe that Kate is a spitfire. But to some degree I wonder why any actress exhibiting those qualities would want to play Kate. For this production it felt like Kate spent the first third of the show spunky and spirited but the remaining two-thirds begging and pleading. Which is a valid rendering of what’s in the text. But if you’re trying to adjust what’s in the text for a contemporary audience I think you want to do whatever you can to keep the last two-thirds of her story from being pitiful. That spark shouldn’t be extinguished (or tamed), but rather should be channeled into different outlets. Without that spark, she ceases to be the woman that Petruchio actually loves. Petruchio has to be different from any of the other men in this world. While he agrees to woo Kate primarily because of her dowry, I think he falls truly and unexpectedly in love with her because of her spirit. Petruchio is not interested in declawing the Tiger and rendering it harmless. If you declaw the Tiger then anyone can wield control over it. If you befriend the Tiger, then it maintains its power and you are in the unique position to be able to influence it. That is the more impressive feat. And in this world, where virtually all of the other men are strutting around trying to prove how impressive they are (in order to win Bianca’s hand), Petruchio can distinguish himself to Kate in their first scene by his sincerity. Granted the moments where he can do that are fleeting, but I think it can be done. Kate is the outcast of her society and the way to infiltrate an outcast is to say “I see who you really are, I understand you and I value you”. (This akin to the “you have never been satisfied” moment between Angelica and Alexander in Hamilton.) If Petruchio can communicate to Kate that he respects her and views them as equals, that’s something she can neither ignore nor run away from. Where Kate and Petruchio differ is that he is a master at playing the societal game, and he uses that knowledge to cheat the system. This is what he must teach Kate. In this production, Petruchio seemed to disregard societal norms entirely which I don’t think ultimately serves their relationship nor Kate’s arc (at least not in the way I’m interested in telling it). in my ideal world, the message that he communicates to Kate is “I get this world and I get you and I’m the bridge that’s going to enable you to say ‘buzz off’ the way you’ve always wanted to.” It’s admittedly a tall order based on what’s in the text, but I think it might be possible. In order for this play to be palatable to me, I’m looking for three main things with regard to the “taming” of Kate. I need to believe that Kate and Petruchio are legitimately the perfect match for each other. For my money, their first scene together is when this has to happen. I’ve mentioned that Petruchio needs to be different from all of the other men in this play. Likewise, Kate needs to respond to him differently than she does to everyone else. Not that she doesn’t revert to tactics that she’s successfully used before (she does), but he gets under her skin (and into her brain) the way no one else is able to. And we need to see that difference. Additionally, any time either of them gets a rise out of the other, is a point for whoever stayed calm and a demerit for whoever got angry. To get angry is to admit that you’re losing ground. If you’re winning an argument, you’re not angry, you’re delighted. So, both sides want to avoid that as much as they can. I need the actual taming to seem as equitable and as necessary as it can be. Which is tricky. It can be helped if we see that Petruchio is suffering the ailments he’s inflicting on Kate as much as she is (i.e. neither one of them are able to sleep or eat and it’s miserable for both of them). Additionally, the distinction between behavior in public vs. behavior in private needs to be well established. In public, Kate needs to behave in a manner that suits her society. In private, when it is just her and Petruchio, she can be herself. I would love to try to establish that Petruchio only insists that she comply with his every command when they are in public – when there is at least one other character present on stage. This feels like a bit of a stretch, but the theme of keeping up appearances that is present, it might be possible to goose that. If this abusive behavior can be put in that context I think it can seem like less of something that Petruchio asserting his dominance and more about Kate learning how she has to play the game. I was struck in this production by the way that the “kiss me, Kate” moment occurred in private. As such, that moment has the potential to be about Petruchio asking for her affection in a really vulnerable way. And it’s a moment where Kate can discover (and reveal) that she actually is attracted to this person, contributing to this private standards vs. public standards, especially if this is only the second time that we’ve seen them be alone together (the first being the “bonny Kate” scene) and it is the first moment of real intimacy that we see between the two of them. In this production I wasn’t sure if Kate and Petruchio had slept together after the wedding ceremony, and that is a big deal. The societal expectation is that they would (and I think it’s important that we see Kate expect that), but if that were to happen at that point in their relationship, in light of how Petruchio just kidnapped her from her own wedding and is about to deprive her of food and sleep, it becomes too violent an act to get past if we want to establish the possibility of a genuine relationship between the two of them. It’s better for the story of their relationship, that we don’t think they have slept together until we can believe that Kate is a willing participant. I need some kind of interpretation of that final speech that allows me to believe Kate has not become a Stepford Wife. In this production, the groveling way in which Kate delivers this speech ends up winning her the beauty pageant which she has unknowingly been part of this whole time, which shocks her back to her senses and prompts her to reject everything she has previously said. I think that’s a valid interpretation (and gives its own spin to the Induction), but it’s not the one that I find most interesting. I’m more interested in treating the story as reality and trying to find a solution to how Kate and Petruchio can exist together afterward. Certainly, there are things that can help this last speech. It helps that in this moment Kate gets to throw Bianca and the Widow under the bus for their churlish behavior. Additionally, it’s also reasonable to say behaving like a jerk (even if it’s justified) only serves to make life miserable for everyone (yourself included). And if we’ve done what we can to establish a solid and loving relationship (or at least the foundation for one) between Kate and Petruchio, there is merit to saying “this is a partnership and in a partnership each party has certain responsibilities”. That being said I would likely look to trim some of the language about women being soft and husbands being demi-gods. This entry was posted in Direct And To The Point and tagged Cotton Wright, direct and to the point, Kate, petruchio, Phyllida Lloyd, Shakespeare, Taming of the Shrew by Cotton. Bookmark the permalink. I’m in the process of reading The Seven Basic Plots by Christopher Booker and he mentioned that the basic plots for Taming of the Shrew and Emma are essentially the same – a smart, feisty, but poorly behaved woman is brought into line by her suitor so that she can get married and live happily ever after. It’s interesting to consider that Emma doesn’t come across as being nearly so galling as Taming. And certainly part of that is the extent of the taming and the intention of the suitors. Petruchio clearly sets out to tame Kate and the process is involved, where as Mr. Knightly merely scolds Emma about the way she has mistreated her friends. It made me think.